All transactions are safe and secure with a reliable history in online purchasing behind each of our associates. Buy the Hap, Hap, Happiest Christmas Speech t-shirt to own Christmas Vacation clothing and merchandise. After numerous disasters befall the Griswold family, including a squirrel being found in the Christmas tree, a cat chewing the tree's lights and a deflated turkey being served for dinner, Clark's relatives decide that they've had enough and begin to head for the door. Unwilling to give in to these unfortunate events, Clark delivers his "hap, hap, happiest" speech in an effort to turn things around. 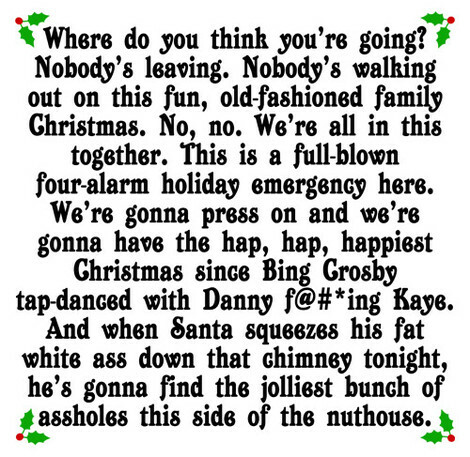 This Hap, Hap, Happiest Christmas Vacation shirt features the Clark Griswold quote. Wear it to inspire your family. In addition to the Hap, Hap, Happiest Christmas Speech tee above, browse the Christmas Vacation Clothing Gallery for more apparel like men's and women's clothes, kids shirts or hoodies.